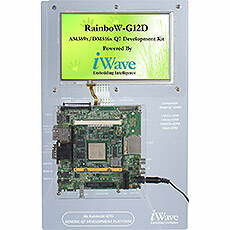 The Development Platform incorporates Qseven compatible AM389x/DM8168 SOM which is based on TI’s ARM Cortex-A8 based Sitara Processor operating up to 1.5GHz and Generic Qseven compatible Development Board. This platform can be used for quick prototyping of any high end applications in verticals like Industrial, Medical and Networking. Being a nano ITX form factor with 120mmx120mm size, the board is highly packed with all necessary onboard connectors to validate complete AM389x/DM8168 CPU features.